Kendrick jumps full force into the second verse and drops a memorable verse, that some may argue stole the track. His abrasive delivery plays off of Jay’s relaxed tone, giving the track more than one dimension, and ultimately allowing “Hood Gone Love It” to avoid any gangsta rap generalizations. Production like this suits Jay well and really lets him flex his storytelling abilities. 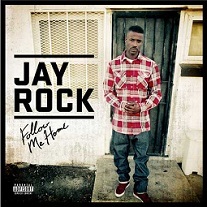 With “Hood Gone Love It”, Jay Rock gives fans an exceptional first single that beats with the heart of West Coast hip hop. Click here to pre-order Follow Me Home.